A stormy session is likely in the Uttar Pradesh Assembly that convenes on Monday as it is set to take up Chief Minister Mayawati's proposal to divide the state into four. She has issued a whip to all MPs and MLAs to attend the Assembly while the SP, BJP and Congress are set to oppose the move. The UP Chief Minster's masterstroke has put her rivals in a quandary. 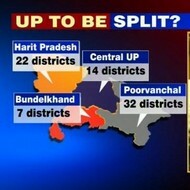 Coming a day after Congress General Secretary Rahul Gandhi threw his hat in UP's political arena, Mayawati, who had talked about trifurcation of the state earlier, came up with a plan to carve 4 states out of Uttar Pradesh. If it were a country, Uttar Pradesh would be the 5th most populous country in the world. When Uttarakhand was carved out in 2000, the fear was that it may collapse, but despite political instability and 6 chief ministers in the last 11 years the state is telling a good story in terms of growth. The annual growth rate of Uttarakhand has rocketed up at 10.8 per cent yearly, while the mother state Uttar Pradesh is far behind at 5.4 per cent. Uttarakhand has tapped its vast hydro potential to become a seller of power to the northern grid.